What is another word for Prohibiting? implemented, barred, outlawed, blocked, closed. 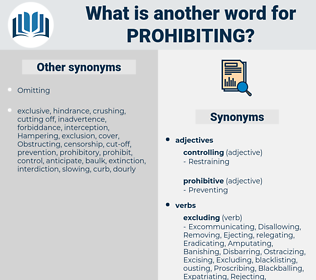 inhibiting, discouraging, limiting, imposing, impeding, Banishing, Excluding, Obstructing, Abolishing, Deterring, criminalizing, constraining, hindering, Exempting, protecting, Depriving, Removing, Hampering, sanctioning, Eliminating, penalizing, curbing, Suppressing, thwarting, Interdicting, halting, barring, Eradicating, Avoiding, Denying, punishing, averting, repressing, Refusing, Reiterating, enjoining, condemning, Indicating, Requiring, ordering, ruling, safeguarding, Combating, shunning, warning, covering, Addressing, Relating, Illegalizing, according, regarding, Phasing, causing, closing, Sentencing, travelling, seeking, dealing, making, Outlawing, Restraining. precludes, excludes, removes, suspends, bars, outlaws. 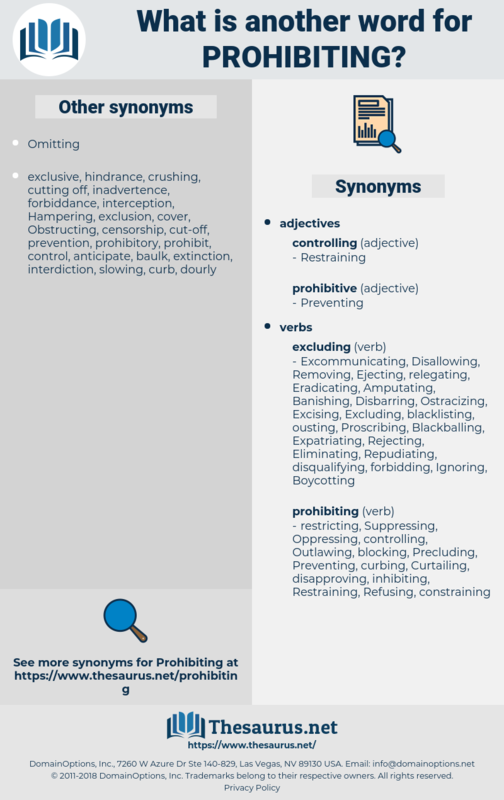 ground, interdict, inhibit, exclude, restrain, curb. There being reason to believe that the act prohibiting the acceptance of British licenses is not a sufficient guard against the use of them, for purposes favorable to the interests and views of the enemy, further provisions on that subject are highly important. In 1885, Congress passed a law prohibiting the importation of laborers under contract, which was supplemented by later legislation. powerboat, peripatidae, purified, parvati, peripeteia, prepaid, private eye, private, parfait, parapet, pauropoda, prophet, pyrrophyta, peripetia, perpetuate, profit, pervade, paper feed, pepper pot, proofed, propitiate, prefaded, peripety, probate, perpetuity, provided with, perfidy, privet, provide, proved, probity, prohibited.